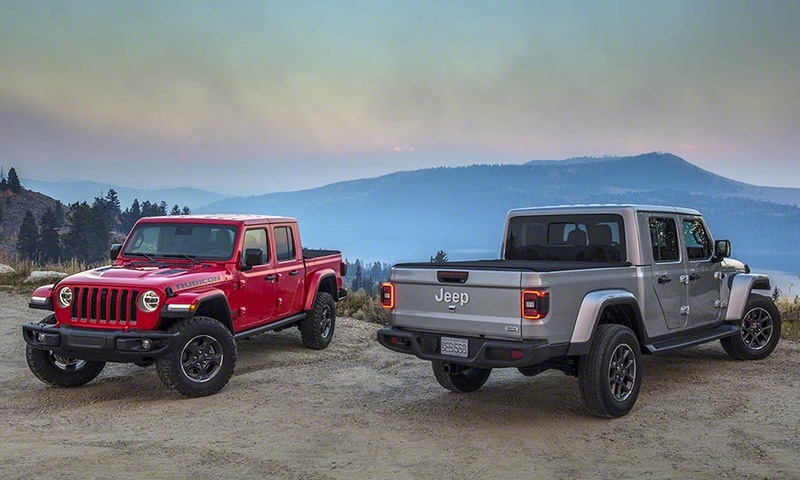 LOS ANGELES -- After a nearly 14-year tease of just-over-the-horizon promises and someday-soon product plans, Jeep showed the first production pickup to carry the brand's name in a generation: the 2020 Jeep Gladiator. 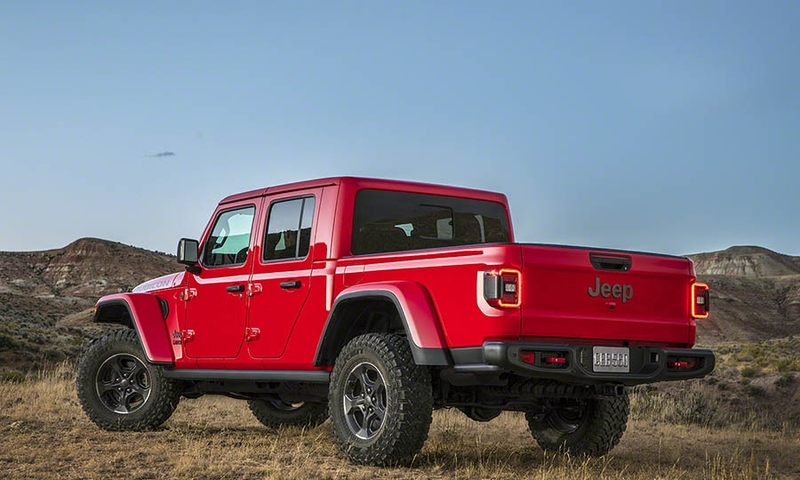 And Wednesday at the Los Angeles Auto Show, the brand put an end date on the horizon and identified someday-soon, promising that the Gladiator -- a descendant of an ultrapopular concept pickup of the same name Jeep first showed in 2005 -- would be in showrooms in the second quarter of 2019. 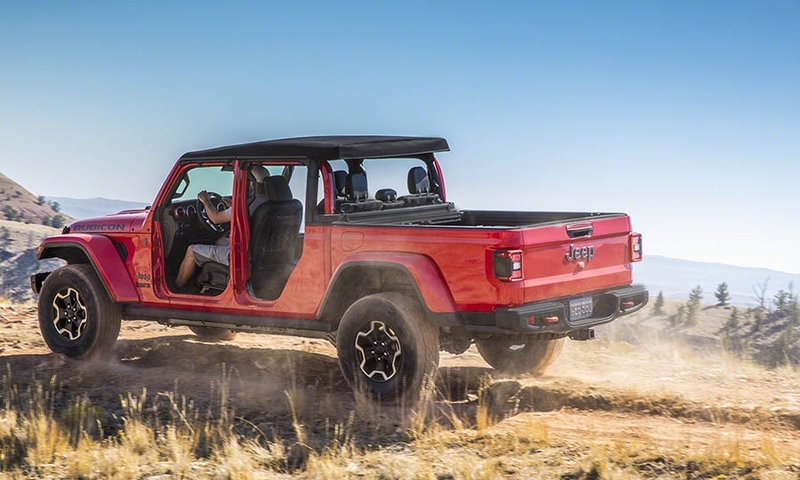 In styling and off-road performance, the 2020 Gladiator is a derivative of the Jeep Wrangler and shares a number of components and key attributes with the latest-generation JL Wrangler that went on sale this year, including removable doors, a removable roof and a folding front windscreen. 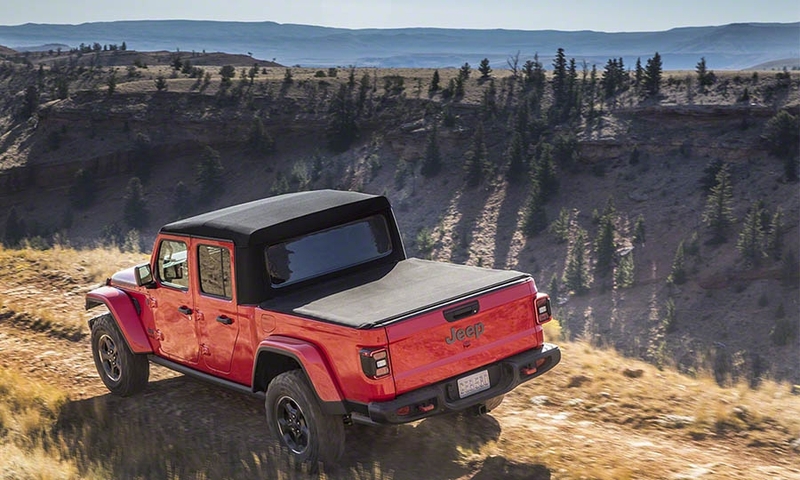 But while it is Wrangler-based, the Gladiator is distinct from the iconic off-roader, with a frame that is 31 inches longer and a wheelbase that is 19.4 inches longer to carry its 5-foot cargo bed. 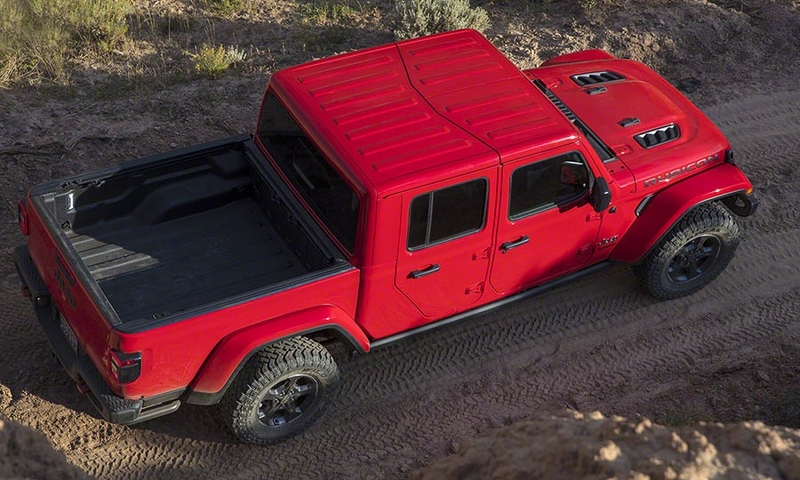 The Jeep Gladiator in Rubicon trim. 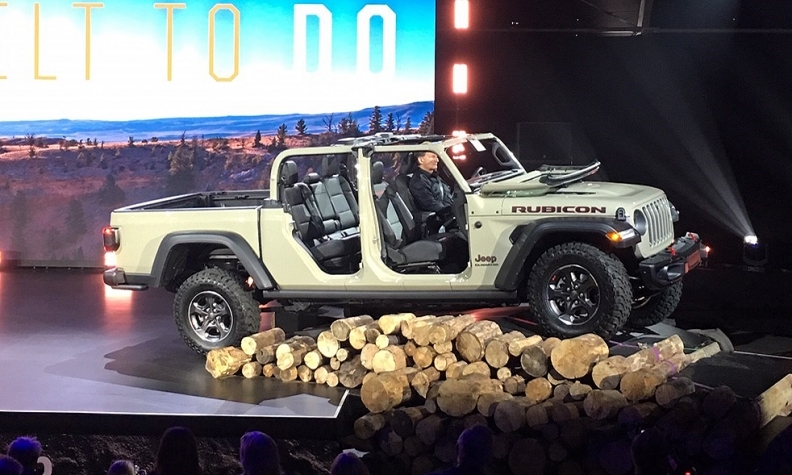 Under its hood clips, the Gladiator will be powered by either the standard 285-hp 3.6-liter Pentastar V-6 gas engine or -- beginning in 2020 -- an optional 260-hp 3.0-liter EcoDiesel V-6 diesel engine mated to either a six-speed manual transmission or optional eight-speed automatic. Both engines will come with electronic stop-start systems standard to improve fuel efficiency. 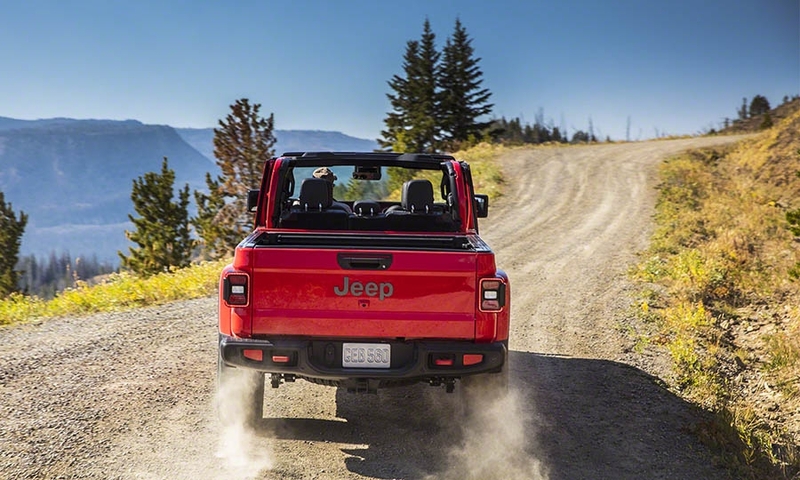 In exterior styling, the Gladiator freely apes the popular JL Wrangler, incorporating much of the SUV's exterior lighting and design cues while departing in some small ways to improve capability. 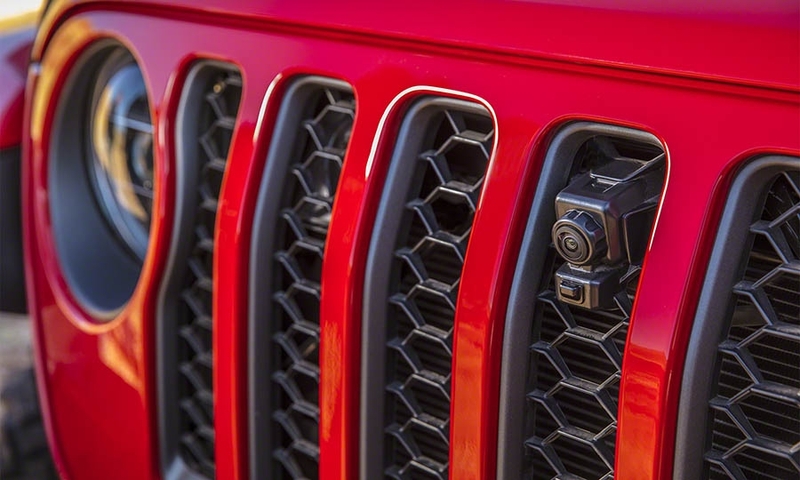 One example: The seven slots in the Jeep grille are larger on the Gladiator than they are on the Wrangler to enhance airflow for towing, allowing the Gladiator to boast up to 7,650 pounds of towing capacity and up to 1,600 pounds of payload capacity with an optional Max Towing package. A standard black hard top, available across all models. A premium Sunrider soft-top system with retainers that slide into tracks to make the top easier to remove and reinstall. 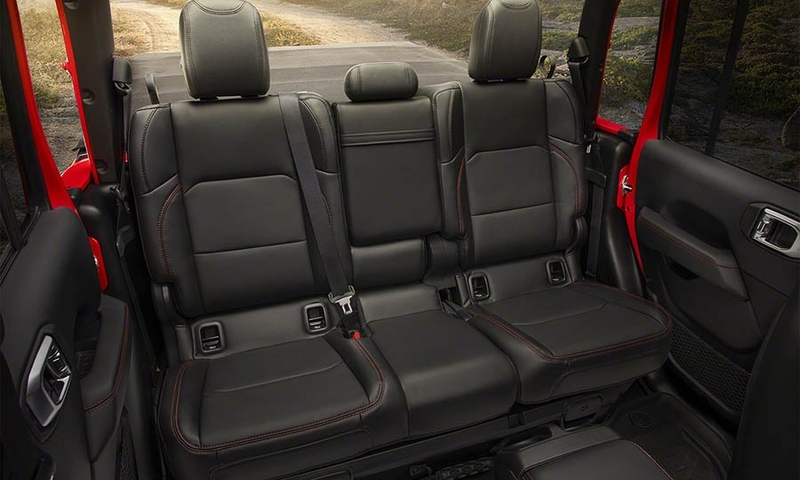 Body-colored removable hard-top options on the Overland and Rubicon trims. The Gladiator's 5-foot bed comes equipped with underrail lighting to illuminate the cargo area, integrated cargo tie-downs and an available covered, external 115-volt plug. 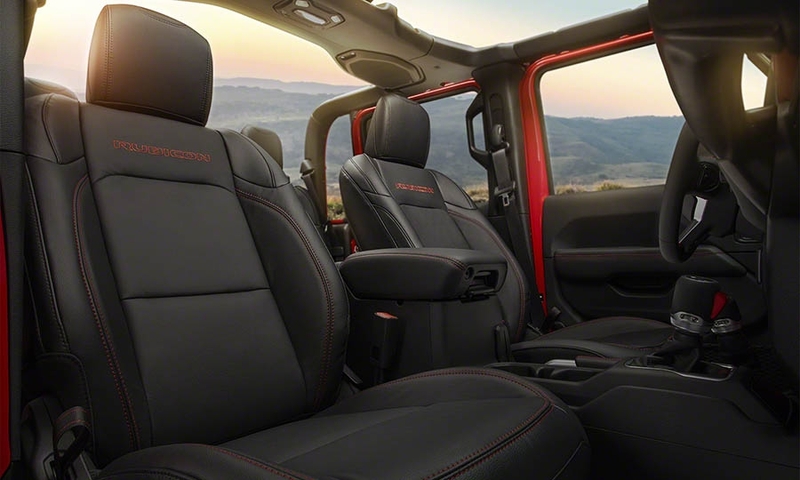 Inside, the Gladiator picks up a number of the Wrangler's styling cues and features, especially in first-row seating and instrumentation, including its optional 8.4-inch touch-screen Uconnect infotainment system. 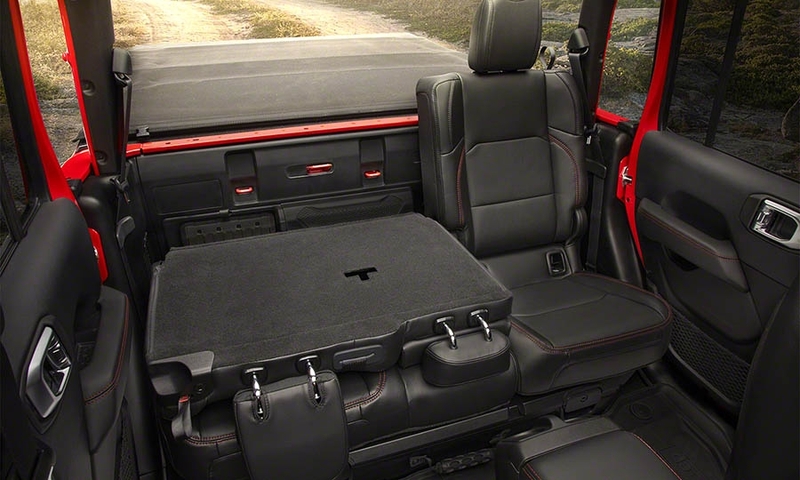 But the second-row seats are exclusive to the pickup, with seat bottoms that fold up to expose a storage compartment with an optional lock, and a seat back that can lock in place for additional secure storage. 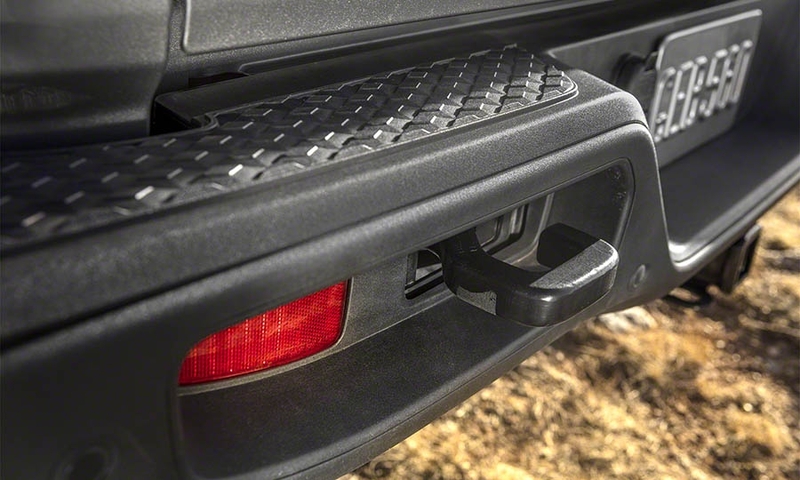 A front-looking camera is standard on Rubicon trim levels to allow the driver a clear view of obstacles ahead during off-road use. 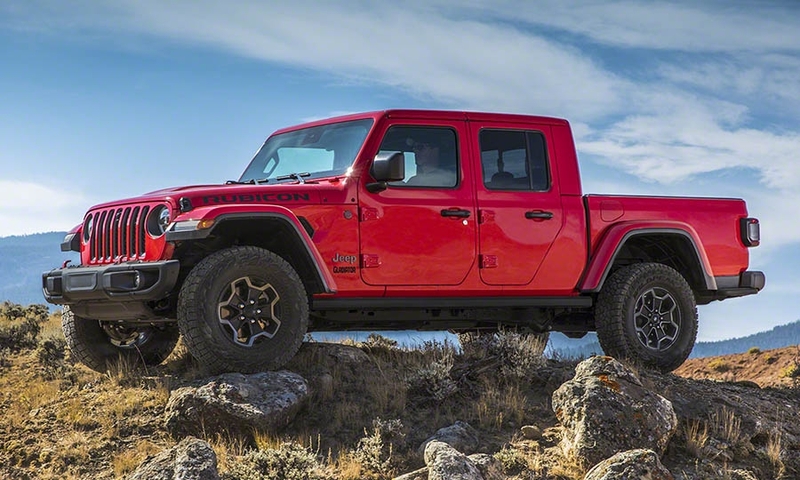 The Gladiator is equipped to hang with the Wrangler in terms of off-road capability, with third-generation Dana 44 front and rear axles, Jeep's Command-Trac 4x4 system on the Sport and Overland trims and its Rock-Trac heavy-duty off-road system standard on the Rubicon trim. 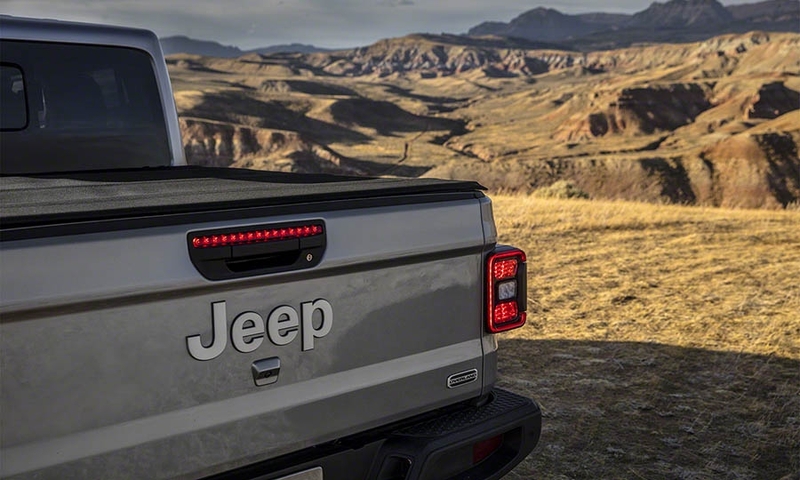 Despite its extended frame, the pickup boasts an approach angle of 43.6 degrees, a break-over angle of 20.3 degrees and a departure angle of 26 degrees, with 11.1 inches of ground clearance, Jeep says. The brand also says the Gladiator is capable of safely fording up to 30 inches of water. Pricing was not announced. 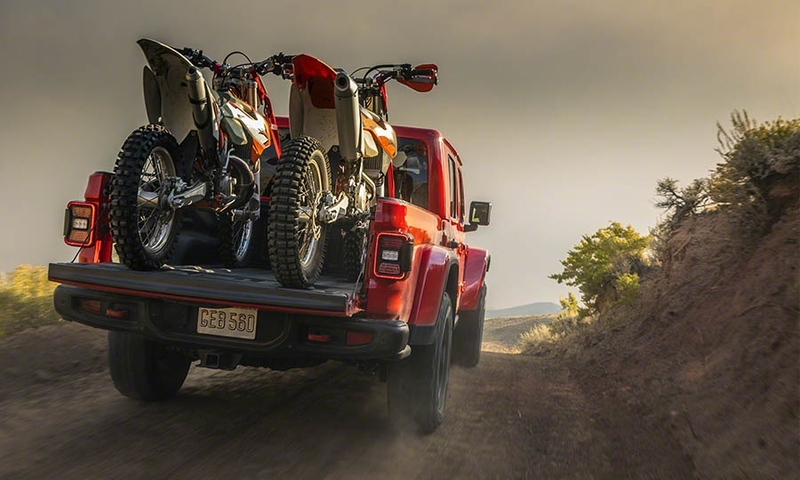 The pickup is being assembled in the southern half of FCA's Toledo Assembly Complex, which also assembles the Wrangler. Workers on the Gladiator line are building pilots daily, with production slated to ramp up significantly after the first of the year.